Digsby is a newcomer multi-protocol IM client. It allows you connect AIM, WLM, Yahoo, and Google Talk. 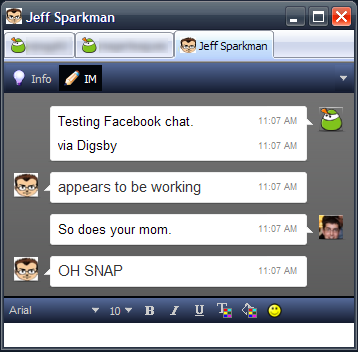 The new version of Digsby now supports Facebook Chat. This initial release includes all the basics - messaging, buddy icons, status, and status messages. Facebook Chat is completely separate from the social network support (Facebook and Myspace) Digsby currently provide for Facebook so you need to add your Facebook account to the IM accounts list.